Homemade Christmas presents are the best! 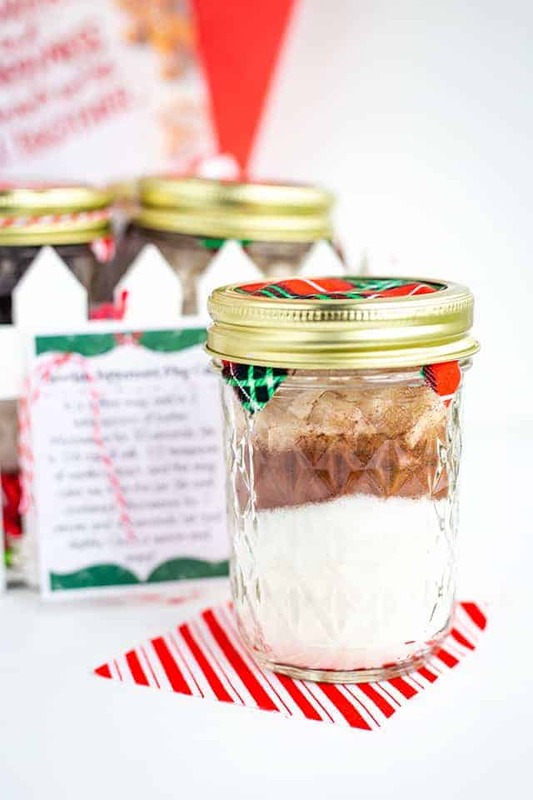 These 4 mug cake mixes in a jar make a nice gift box for any dessert lover. There’s a flavor for everyone! Cookies n’ Cream, Chocolate Peppermint, Snickerdoodle, and Hot Cocoa, do you know anyone that would love these mug cake flavors? The post has been sponsored by American Greetings. All thoughts and opinions are my own. Does anyone else have cards catch their eye as they’re walking by? 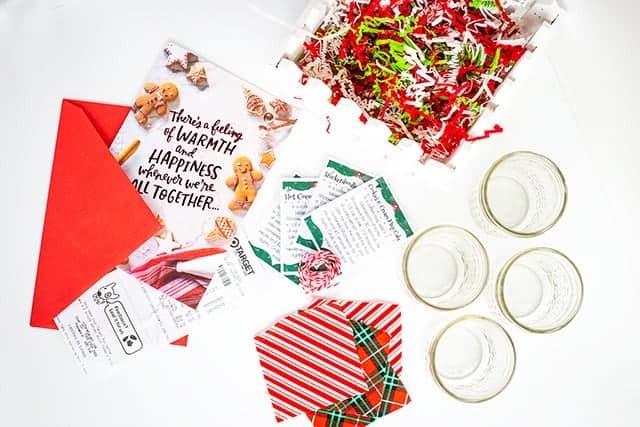 I usually stop in my tracks to check it out, and American Greetings has so many eye-catching holiday cards that it’s hard to pick which you like most. I found the perfect American Greetings holiday card at my local Target. It couldn’t have been a better fit. It was labeled daughter and spouse and had a baking scene on the front. 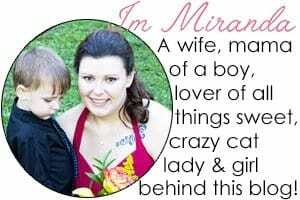 I was totally drawn in. 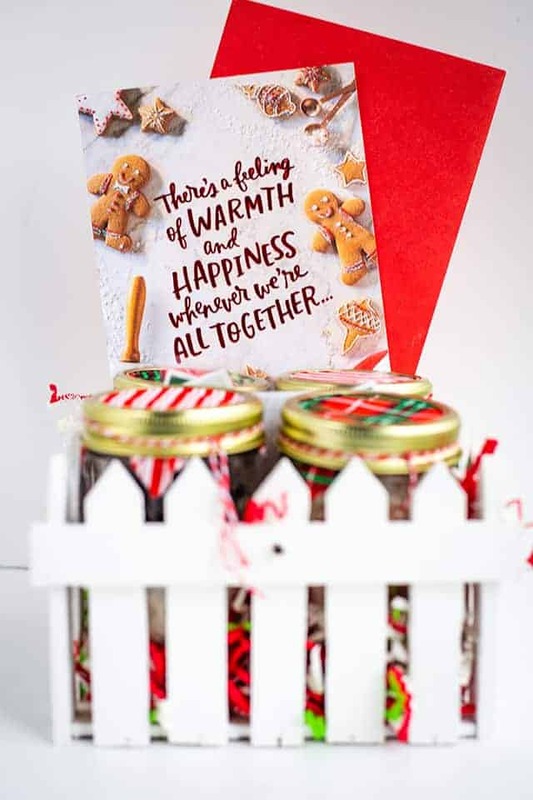 You can check out the American Greetings Holiday Hub here. That’s the thing about shopping at Target. They have so many eye-catching things. I love to browse their dollar section, kitchen section, home decor section, holiday section, and basically the entire store if I’m honest. It’s the first place my son asks to go when we’re having a family day out, shopping and going to dinner. These printable recipe directions are important. 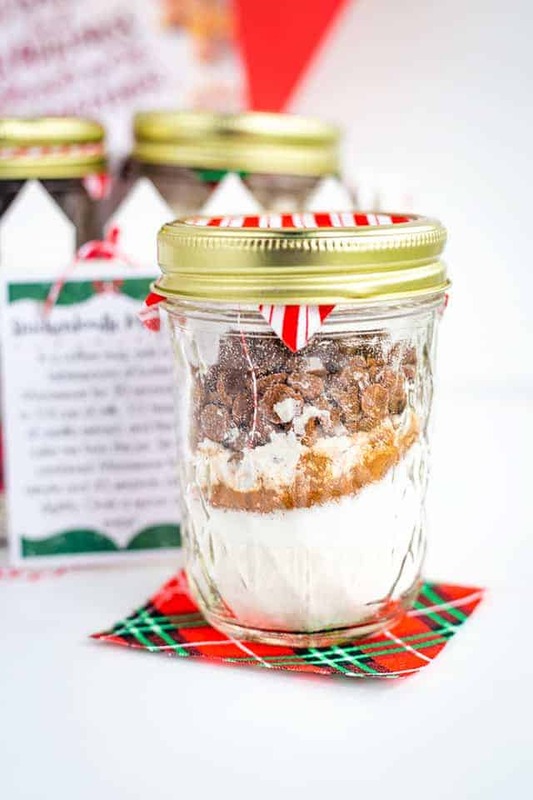 They’ll let the recipient of the mug cake mixes in a jar know how to actually make the mug cakes. Be sure to attach the right label to the right mug cake. 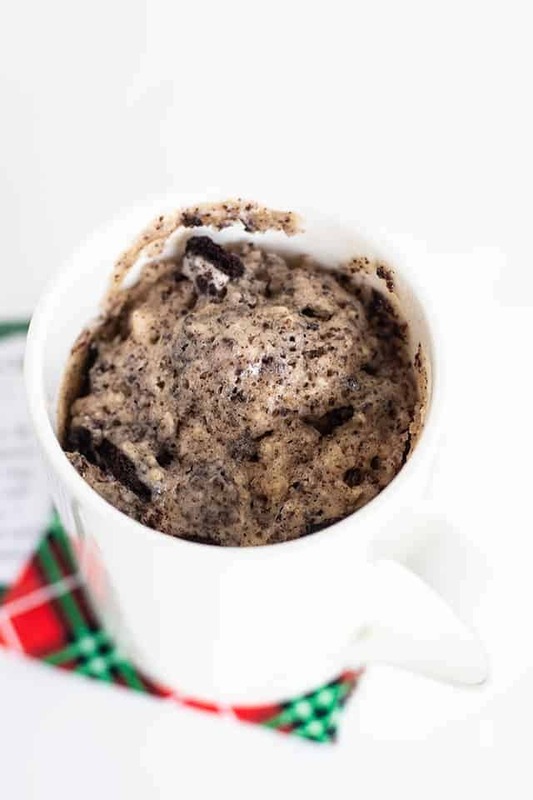 It should be pretty obvious that the cookies n’ cream mug cake will have cookies at the top and the hot cocoa mug cake will have the mallow bits. 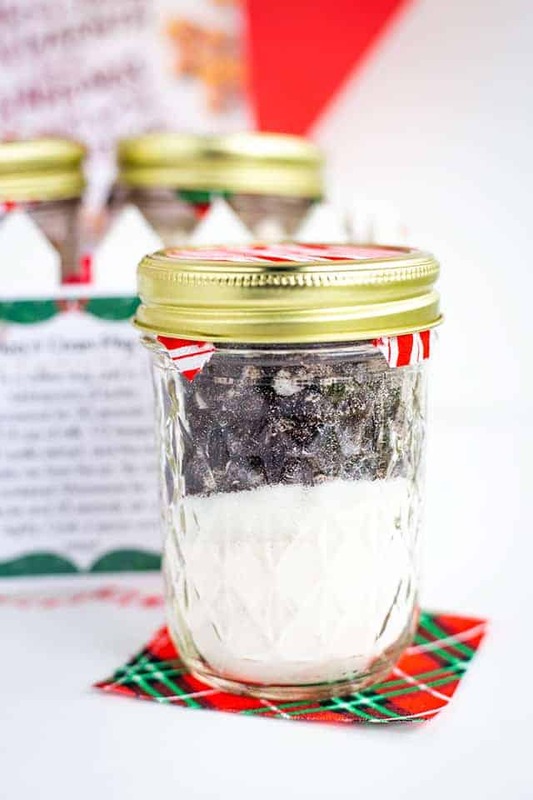 The canning funnel comes in handy to add dry ingredients into these mason jars. It, for the most part, keeps anything from missing the jar and landing on the table. I recommend adding the dry ingredients in the order of the list, starting with the flour and working your way down. Give the glass jar a few taps on the counter after each layer to help flatten out the dry ingredients. 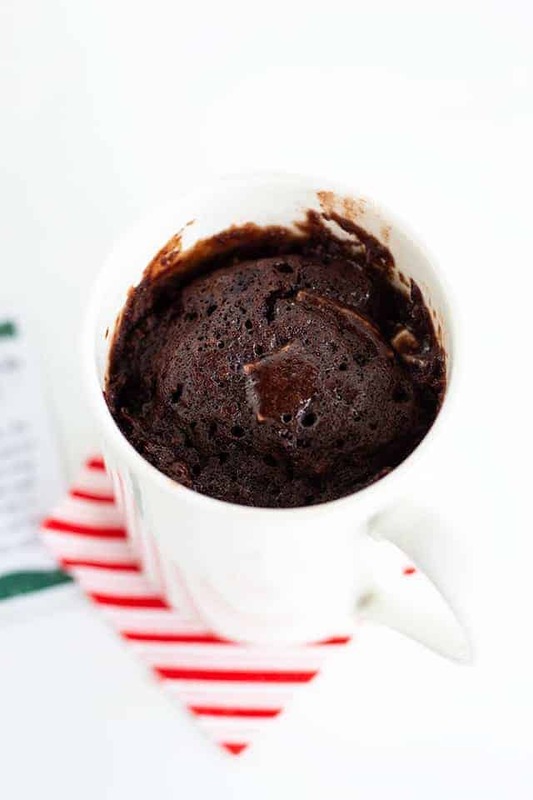 Then when you’re ready to use it, just follow the directions for adding the butter, milk, vanilla extract, and the chocolate peppermint mug cake mix. 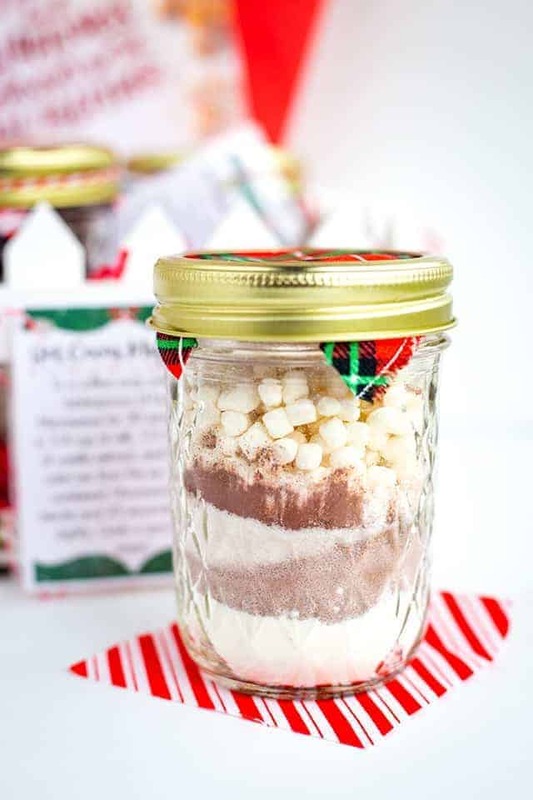 I like to pull a few pieces of the peppermint chunks out of the top of the mason jar and add them on top after the mug cake batter is made. It ensures that you will definitely have peppermint chunks at the top of your cake. 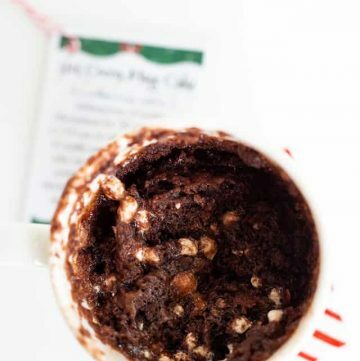 The chocolate peppermint mug cake tastes just like the chocolate peppermint patties that you can get in the candy aisle. 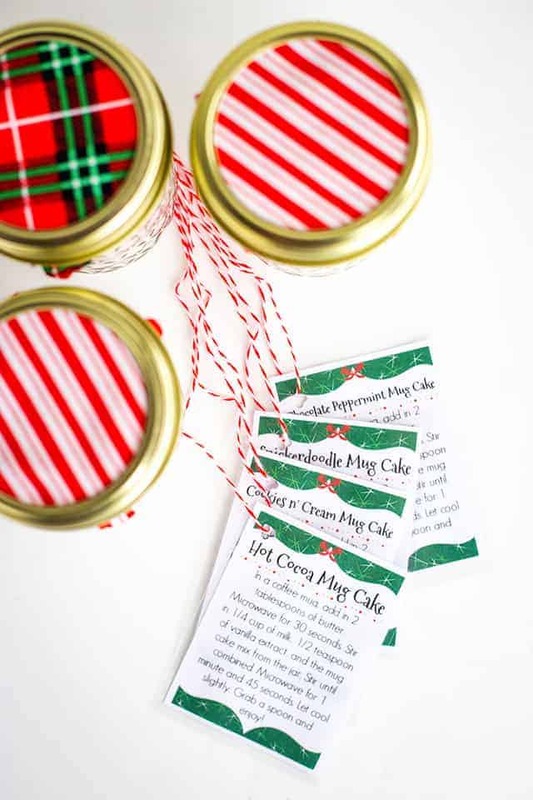 The peppermint chunks get soft and melty and pair nicely with the rich, chocolaty cake. Make sure you’re adding them to the jar in this order starting with the flour and working your way down. Give the glass jar a few taps on the counter after each layer to help flatten out the dry ingredients. I’ve had people ask me “where can I get cinnamon chips?” several times. I typically find them at my local grocery store or online. I’m always looking for them since I have a killer pumpkin fudge recipe that requires them. Then when you’re ready to use it, just follow the directions for adding the butter, milk, vanilla extract, and the snickerdoodle mug cake mix. Again, a fun tip is to just pull a spoonful of cinnamon chips out of the top of the jar before adding it to the batter. Then just before microwaving, sprinkle them on top. 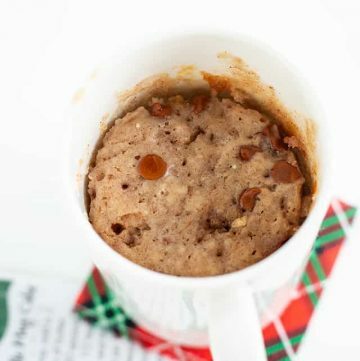 I really love this snickerdoodle mug cake. It’s so sweet and spicy. The cinnamon chips pack a punch of flavor. The cinnamon chips are the size of mini chocolate chips, so they can easily be distributed all through the batter. 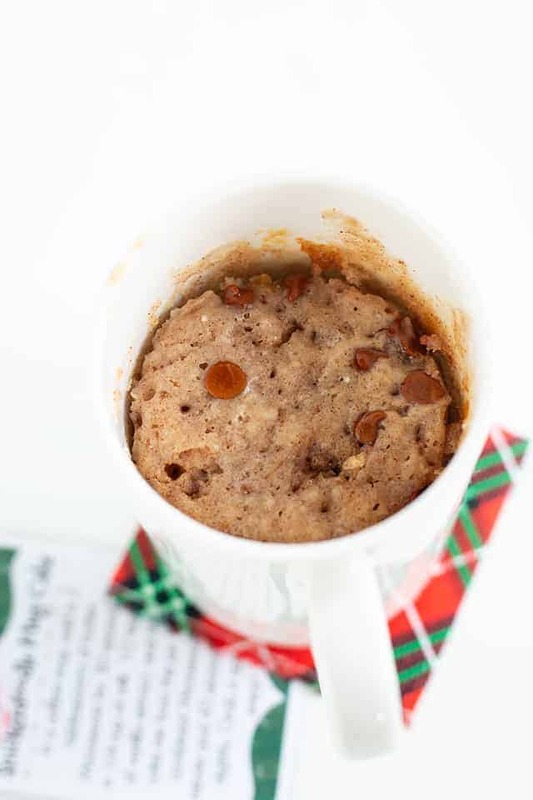 You’ll find that the snickerdoodle mug cake is super moist and slightly dense. I recommend adding them in this order, starting with the flour and working your way down. Give the glass jar a few taps on the counter after each layer to help flatten out the dry ingredients. If you can’t find mallow bits, they’re always online. 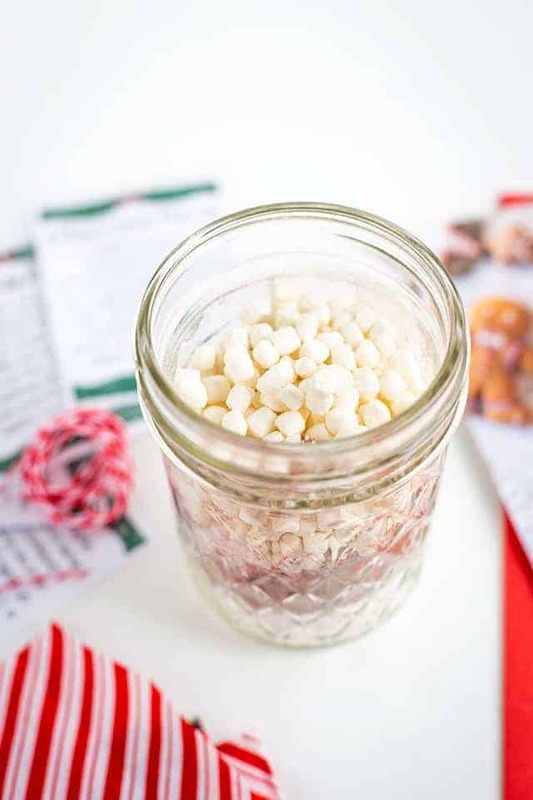 For a substitution, use regular mini marshmallows or even use the marshmallow packets from the marshmallow lovers hot cocoa. Then when you’re ready to use it, just follow the directions for adding the butter, milk, vanilla extract, and the hot cocoa mug cake mix. Scoop out a spoonful of mallow bits to reserve for the top. Add them just before cooking in the microwave. 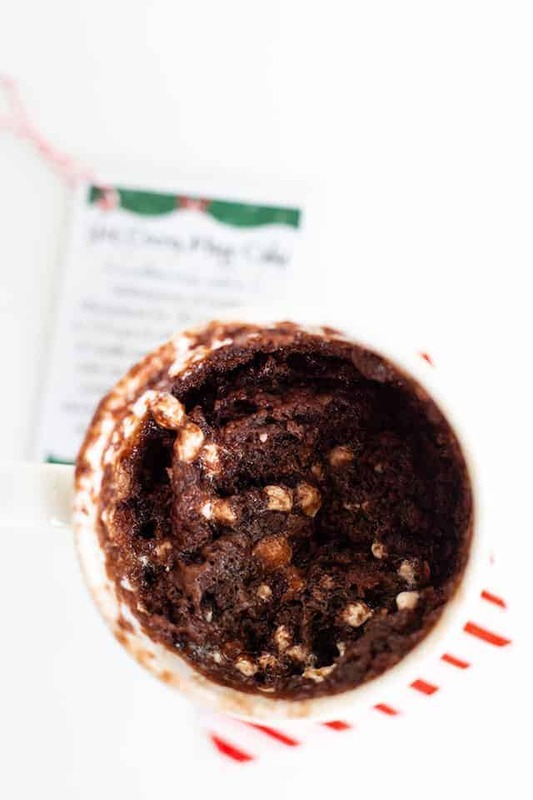 Okay, so the hot cocoa mug cake is the least pretty—blame the mallow bits. It is, however, one of the best tasting mug cakes. It tastes just like a cup of hot cocoa but in cake form. It’s moist, dense, and highly addicting. Most of the mallow bits just sort of absorb into the cake, You’ll see at the top of the hot cocoa mug cake that there are some extra gooey bits. They were equally as exciting to eat as they are when they’re floating at the top in a cup of hot cocoa. Again, start by adding the flour to the jar and then work your way down the list. Give the jar a tap after adding each ingredient. This one doesn’t have as many contrasting layers as the others, but it really makes up for it in flavor. 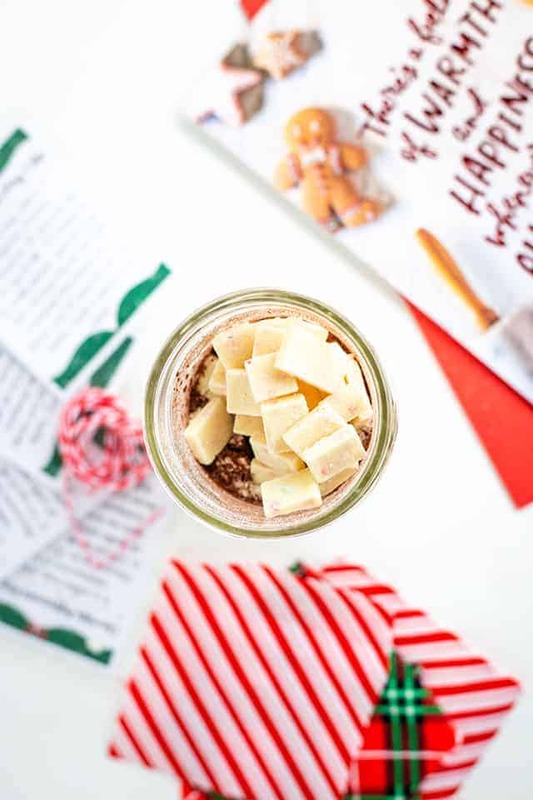 Then when you’re ready to use it, just follow the directions for adding the butter, milk, vanilla extract, and the cookies n’ cream mug cake mix. Scoop out a spoonful of cookie bits to reserve for the top. Add them just before cooking in the microwave. I had the hardest time making this cookies n’ cream mug cake. There just wasn’t enough cookie flavor for me at 2 cookies. Once I added a third cookie, I was content. The flavor was there, but then it was semi-dry. I tweaked the flour measurement and we’re good to go now! 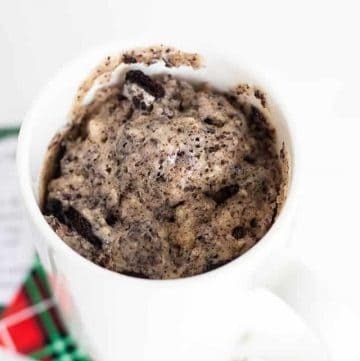 This cookies n’ cream mug cake is so fluffy. The cookies are soft and just become part of the cake. There’s no need to worry about crunchy pieces in the cake, except maybe the few pieces you sprinkled on top. I definitely think it’s crucial to add vanilla extract to this recipe. It helps flavor the cake part so you’re not just depending on the bits of chocolate sandwich cookies to provide all of the flavor. After all of the mug cake mixes are made, place a lid on top of the each of the jars. Grab some Christmas fabric and cut out 3 1/4 inch by 3 1/4 inch squares. Place the square of fabric on the top of the lid and twist the ring onto it. If you have wrinkles, loosen the ring up and straighten out the wrinkles in the fabric. Tighten the ring back down. Tie your Printable Recipe Directions label using the baker’s twine around the ring of the jar. 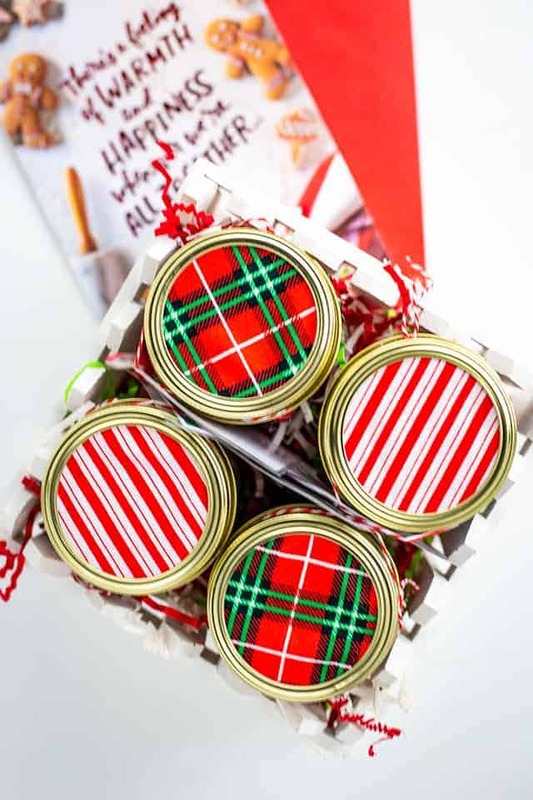 Add the 4 jars of mug cake mix into the gift box. Make sure the box is about 6 inches by 6 inches. That’s the perfect size to fit 4 mug cake mixes in a jar into it. Add some festive tissue paper to the bottom of the box, too. You can find these things at Target. They have the cutest holiday items to use. 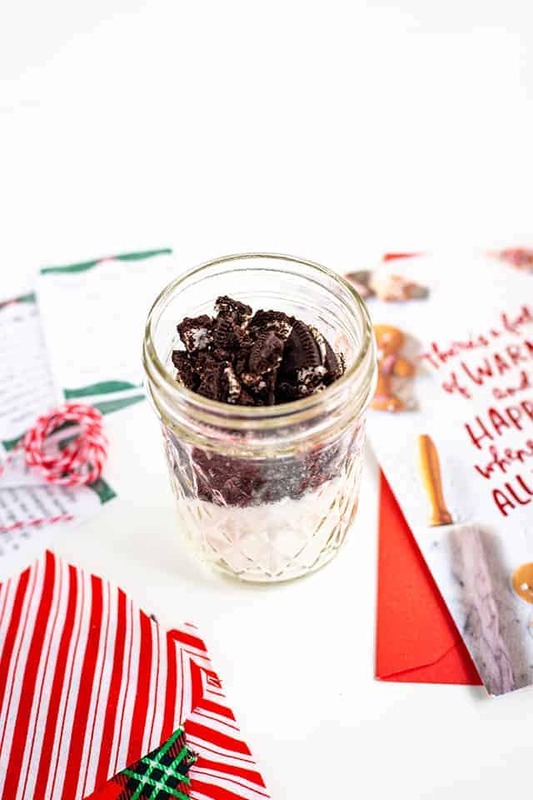 Grab your American Greetings holiday card that you’ve written a sweet note in, and tuck it right in the center of the box between the mug cake mixes. Can’t think of anything to write in your card? Click here to get some great ideas! In a 14 oz. mug, add in the butter. Place into the microwave for 30 seconds. Add in the vanilla extract, sugar, flour, cocoa powder, baking powder, milk, and peppermint chips. Stir until the mixture comes together and most of the lumps are gone. Place into the microwave for 1 minute 30 seconds to 1 minute 45 seconds. I've had the best luck with 1 minute 45 seconds. Let cool for a minute or two. 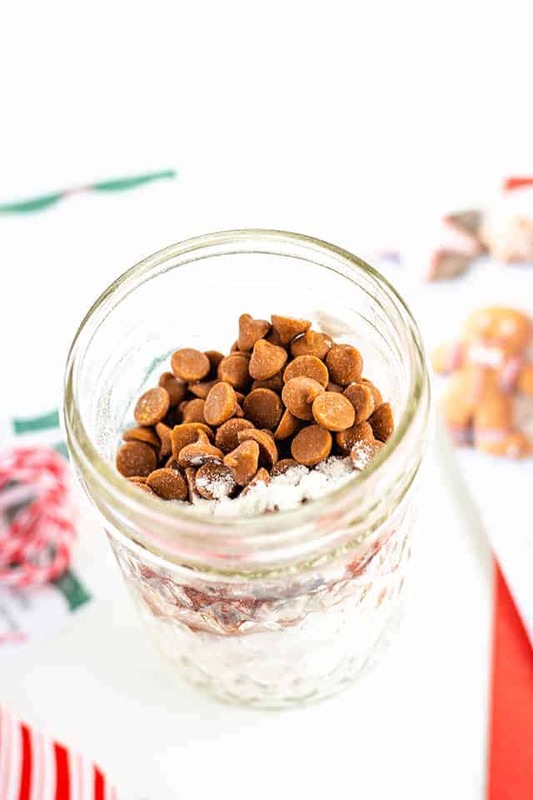 Reserve a spoonful of peppermint chunks and sprinkle on the top of the batter just before microwaving. This will ensure that there will be peppermint chunks at the top of your cake. The cake is best consumed within the first hour of microwaving. Add in the vanilla extract, sugar, flour, baking powder, cinnamon, cornstarch, milk, and cinnamon chips. Reserve a spoonful of cinnamon chips and sprinkle on the top of the batter just before microwaving. This will ensure that cinnamon chips will be at the top of the cake. The mug cake is best consumed within an hour of microwaving. Add in the vanilla extract, sugar, flour, hot cocoa mix, cocoa powder, baking powder, milk and mallow bits. Reserve a spoonful of mallow bits to add to the top of the batter just before microwaving. This will ensure that there will be mallow bits at the top of the mug cake. 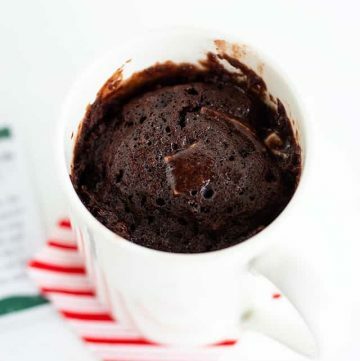 This mug cake is best consumed within 1 hour of microwaving. Add in the vanilla extract, sugar, flour, baking powder, milk, and cookies.